Save money, exercise more, try something new; not only are these popular New Years Resolutions, but three things you can accomplish in 2014 with the help of the Mission Bay Aquatic Center. To kick off 2014 we are offering 10% off classes to get you out on the water for a resolution-friendly price! For the entire month of January, you can save 10% on all our recreational classes* scheduled to start before March 31 with promo code: RESOLUTION. 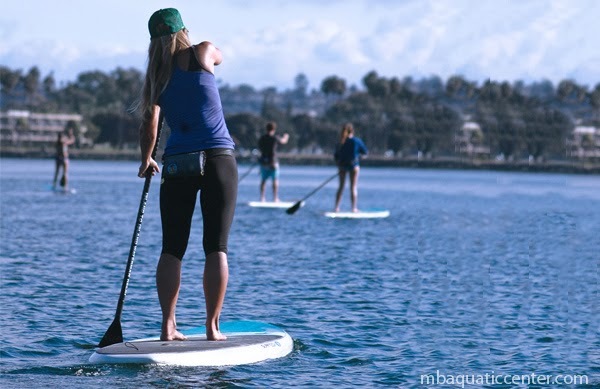 This includes classes that will get you in shape, such as our stand up paddling fitness classes, our 8-day rowing classes, or our classes which may give you a lifetime of enjoyment, such as our sailing and surfing classes. With the wide variety of watersports we offer, you are sure to find a class that sparks your interest! Surfing, sailing, kayaking? There’s no better time, or price, to help all your New Years goals come true! Take advantage of this phenomenal deal and join MBAC as we make 2014 the best year yet! *Recreational classes run weekends and evenings for up to 1-month in length. Excludes college credit classes, packages, ENS classes and USD Education Recreation classes. Offer expires January 31. Cannot be combined with any other coupons or offers.